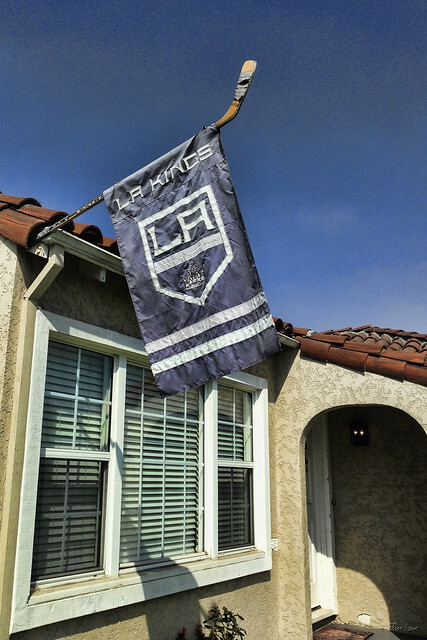 Downey Daily Photos: Go Kings go! I've been a Kings fan since the early 1970s, when the Kings were a relatively new team playing in the Forum in Inglewood, and two midweek tickets with the Ladies' Night discount cost only $5 total. Wins were rare back then and the Stanley Cup was merely a dream. But not tonight, when the LA Kings' Alec Martinez scored and the Kings defeated the New York Rangers 3-2 in double overtime to win the 2013-14 Stanley Cup.